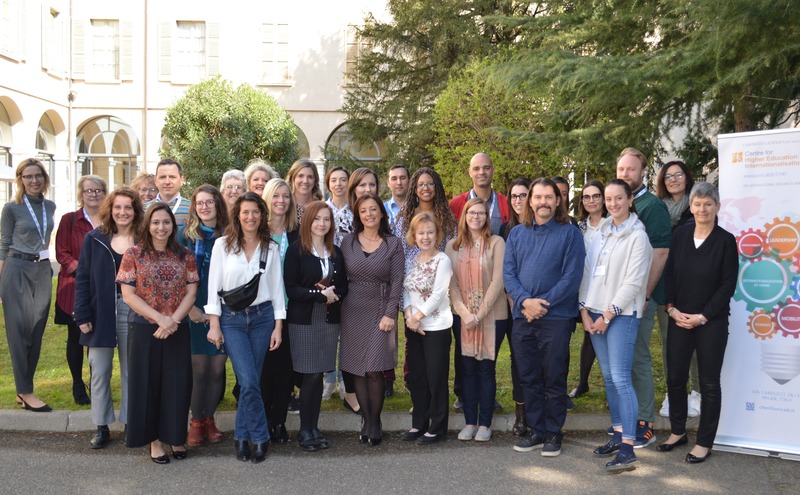 We were delighted to host participants from nine different countries at our Spring 2019 PhD Research Seminar on internationalisation of higher education in Brescia (25-29 March). Our programme offered sessions on PhD methodology and plenary sessions on current developments in internationalisation, held by our esteemed academic team. Our next PhD Research Seminar will be held in Milan 16-20 September and we look forward to another rich international mix of students and academics. The CHEI PhD research seminar is held twice a year and is open to a broad international community of students and scholars with an interest in the internationalisation of higher education. Participants include current and prospective CHEI doctoral students, and Italian and international doctoral students from other programmes. CALLmi: Where are we going? is an international two-day symposium focusing on recent research in Computer-Assisted and Mobile-Assisted Language Learning, and learning through Virtual Learning Environments, to be held 23-24 May in Milan. The symposium is offered by the Department of Language Sciences and Foreign Literatures and the Centre for Higher Education Internationalisation at Università Cattolica del Sacro Cuore in Milan, together with the EuroCALL MALL SIG. It will focus on the latest research and practices in technology-mediated language learning and explore perspectives for effective technology integration in language teaching and learning in various educational contexts globally. The symposium is open to researchers, including doctoral students, practitioners and teacher educators. Attendance is free but registration is required (open until 13 May). This one-day international workshop on Internationalisation at Home will be held on 28 May at the Milan campus of Università Cattolica del Sacro Cuore. The workshop will be of interest to academics in any discipline, including those using English as a medium of instruction, faculty or university level administrative staff, programme designers and developers, as well as policy advisers and curriculum leaders. The focus will be on practical ideas for implementation and developing an understanding of how everyone has a role to play in delivering internationalisation at home. The day includes an open seminar on the administrative role in internationalisation which draws on the learning from the SUCTI Erasmus+ Project. The academic team is made up of Elspeth Jones (Honorary Visiting Fellow at the Centre for Higher Education Internationalisation - CHEI), Tanja Reiffenrath (University of Göttingen) and Fiona Hunter (Associate Director of CHEI). There is no registration fee but online registration is required before 15 May. Fiona Hunter, Associate Director of the Centre, has been appointed to the AVEPRO Scientific Council. We warmly congratulate Visnja Schampers Car on the award of her PhD today! We take great pleasure in congratulating Ravi Ammigan for bringing his Doctorate in the Internationalisation of Higher Education to completion. It is with great sadness that we share the news of the sudden death of Professor Giuseppe Mari. The CHEI Doctoral Programme is directed at aspiring researchers and professionals in higher education internationalisation and focusses exclusively on internationalisation of higher education. The Centre for Higher Education Internationalisation (CHEI) is co-author of Internationalisation of Higher Education together with the International Association of Universities (IAU) and the European Association for International Education (EAIE). The study was commissioned by the European Parliament and analyses the current state of internationalisation of higher education in Europe and outside Europe. It identifies key trends and draws a picture of the future of itnernationalisation in Europe.